Camp Moose On The Loose VBS Full Review Coming Soon! Head for the hills to “Camp Moose on the Loose!” RBP brings canoes, tents, and fishing poles for the camping trip of a lifetime as your kids discover “God’s Forever Forgiveness.” With a firm emphasis on the salvation message, Moose on the Loose puts its focus on the Gospel. Awesome songs, puppet scripts, and tons of surprises are in store for your VBS kids. Come explore the woods for clues about God’s love and forgiveness available through Jesus Christ’s sacrifice for our sins. Hit the trail to adventure. Spend your days under the pines nights under the stars. 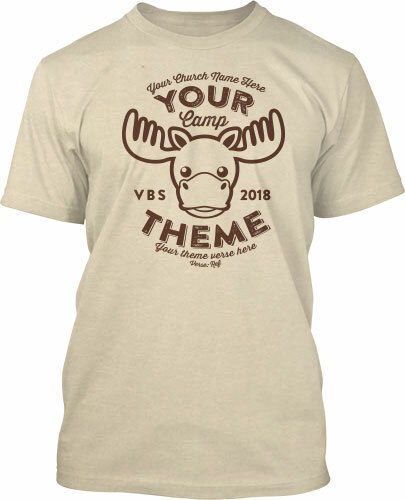 At Camp Moose on the Loose, your Vacation Bible School kids will move day to day from campsite to campsite as they hike through the back country to learn about God’s forgiveness. At Campsite 1 they’ll meet Jesus by the shore to learn that He calls us to follow Him. Campsite 2 is along the trail where they’l hear about Jesus’ love and forgiveness. Then at Campsite 3, they’ll be under the stars to hear about how their sin creates their need for forgiveness. Campsite 4 is just before the dawn and shows that Jesus’ forgiveness covers all sins. Finally, they’ll gather around the campfire at Campsite 5 to discover God’s forever forgiveness. MUSIC: Kids of all ages are gonna love the stripped-down, country-style piano backing for the songs of Camp Moose on the Loose. The opening theme sounds like a cascading waterfall of piano and harmony as it welcomes kids to come discover the love and forgiveness of Jesus. Camping Out Under the Stars takes us through all the favorite areas of camp and looks forward to “when the day turns into night and the campfire’s burning bright, marshmallows and chocolate bars singing and playing guitar.” Other songs like If We Confess (1 John 1:9) and Everlasting Love (Jeremiah 31:3) are simple musical takes on solid scripture which your kids need to learn. And the lovely Michael W. Smith song Step By Step is a mediation for kids to ever praise God, to seek him, and learn to walk in His way. 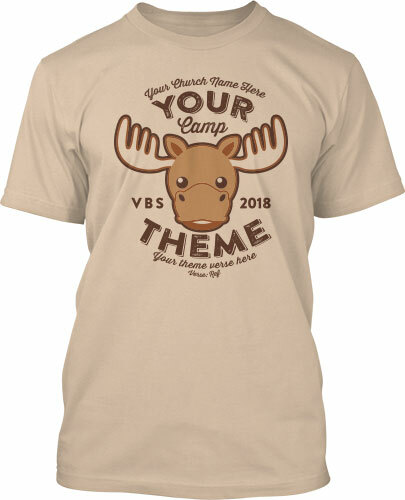 THE EVANGELISTIC VBS: When Regular Baptist Press makes a new VBS curriculum, their first priority is to go beyond the snacks and games to ensure that your kids are confronted with their need for a savior. Camp Moose on the Loose endeavors to offer sound theological teaching for kids to understand the Bible in age-appropriate ways. That means the Gospel message threads through the whole of each lesson! That’s why Child Evangelism Fellowship recommends Camp Moose on the Loose for reaching kids with the Gospel. PRO-TIP: Let’s keep it real, shall we? Kids are so inundated with cartoons, video games, and fantasy worlds these days that it’s not easy to keep them from seeing VBS as a land of make-believe. And sometimes volunteers who grew up on a similar media diet are tempted to take pretending a little too far. So playing dress up and acting silly can sometimes confuse your kids about what’s true and what’s not. Encourage your volunteers to remember that even though VBS is full of fun and games, the stories your sharing are true. EXTRAS: We get so excited about all the clever goodies VBS publishers pair with their curriculum. Whether it’s snack ideas, crafts, or props, we pulled together our favorites and must-haves from RBP’s Camp Moose on the Loose. Lids for Kids – Don’t go camping without the proper headgear. We love the hats and headbands you can get with this VBS. The fun, emoji bucket hats, plush antlers, and coonskin hat help everybody get their heads into the game. Inflatable Buddies – Sometimes the cute factor gets to us. As t-shirt designers, we get a kick out of fun design, so the inflatable raccoons and owls really make us smile. Protecting Your Kids – Just like there’s dangerous predators out in the forest, we need to be on the look out for dangers within our schools and churches as well. Even though it’s not fun to consider, we’re proud of RBP for adding two titles to help churches address child abuse and keep their kids safe at VBS. Purchase or pre-order your copy of Camp Moose On The Loose from RBP HERE. 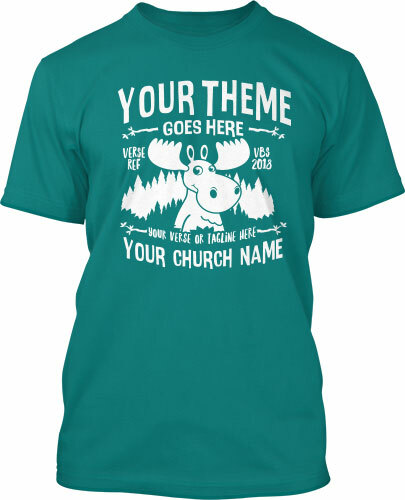 Gotta Catch That Moose: Choose a Moose below and get a free digital mockup of your 2018 VBS t-shirts today! Get your team excited early for next Summer.